"How shall we live? Welcoming to all." 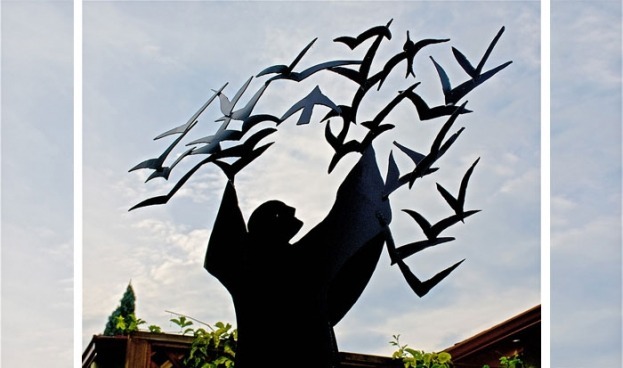 A new sculpture called "Saint Francis and the Birds" was recently celebrated among neighbors at Pilgrim Place in Claremont, California, a senior community committed to justice and peace. Commissioned by Mary Ann and Frederic Brussat, co-founders of Spirituality & Practice, this sculpture was born of art templates from the late artist Frederick Franck. This fresh interpretation of the saint sweeps the eye upward in a feeling of celebratory movement, gratitude, and hospitality. Here Saint Francis welcomes a panoply of birds circling and hovering about his uplifted arms. You can almost hear the saint preaching to these exuberant birds, calling out to them, "My little sisters the birds . . ."
The sculpture stands tall on a round rock base behind the Brussats' home. But it is not theirs alone to enjoy. In the spirit of hospitality, the Brussats invite all their neighbors at Pilgrim Place to visit the site for moments of quiet contemplation, prayer, and communion with nature. Dogs included. As reported by the Pilgrim Place Post, Mary Ann also suggested a little Francis-style preaching to the wildlife. "Try preaching to the birds. And if there are no birds around, preach to the squirrels. Such generous, cross-species hospitality is fitting, for in Bonaventure's Life of St. Francis, the story of the St. Francis' sermon to the birds is set in the context of hospitality, that is, in widening the circle of God's loving embrace. The story goes that St. Francis was struggling between two competing choices: devoting his life to seclusion and prayer or to continue his itinerate ministry of preaching the gospel. He sends for the wisdom of two of his most trusted colleagues, who both agree that Francis must continue his traveling ministry. The first thing that Francis does after hearing this news is to preach to the birds. In an article "St. Francis and the Birds," Franciscan friar Jack Wintz says, "I believe that Bonaventure is trying to shock us into widening our horizons, and into learning with Saint Francis that the whole family of creation deserves more respect and ought to be invited to praise God along with us human beings." St. Francis would be saddened by our present state of affairs. What a shocking and reckless world it would appear to him, the way nature is commodified by powerful economic forces — even in the face of our daunting climate crisis. Neither would this saint, who crossed social boundaries in his work for the poor, understand the cry, "Build the wall!" to keep the "stranger" out when Jesus so clearly stated, " . . . for I was hungry and you gave me food, I was thirsty and you gave me something to drink, I was a stranger and you welcomed me" (Matthew 25:35). We find this Christ-like, expansive view of God's embrace in the humble saint who preached to the birds, teaching them gratitude for their freedom and flight, mirroring his own sense of gratitude for his bird-like freedom to move about in his ministry with trust for daily sustenance. He probably saw himself in the birds, as do poets and artists and contemplatives. What would happen if more of us could see ourselves in the birds? What if we could expand our sense of self — our very souls — to include "our little sisters the birds" or the stranger or the refugee? This kind of soul-expansion, which can be countercultural and daring, is what process theologian Jay McDaniel and I like to call "fat soul" spirituality. A fat soul — or spacious soul — is hospitable to God's own wide embrace. When our souls are no longer thin and fearful but open, full, and ripe with compassion, we begin to see ourselves mirrored in one another, in "the least of these" in our communities, and in the colorful finches that feast from the bird feeder in winter. "By size I mean the stature of a person’s soul, the range and depth of his love, his capacity for relationships. I mean the volume of life you can take into your being and still maintain your integrity and individuality, the intensity and variety of outlook you can entertain in the unity of your being without feeling defensive or insecure. I mean the strength of your spirit to encourage others to become freer in the development of their diversity and uniqueness. I mean the power to sustain more complex and enriching tensions. I mean the magnanimity of concern to provide conditions that enable others to increase in stature." This passage reminds us that soul hospitality is the more difficult and courageous path because it means more "enriching tension" and complexity to deal with. It's easier — at least one imagines — to simply exclude and wall out others for the sake of easy harmony. But do we want an easy, static, lack-luster harmony? Harmony is often associated with both beauty and peace. But neither beauty nor peace is created out of exclusion. Whether a piece of music or a philosophical idea, true beauty is never bland homogeneity, but rather the result of enriching, intense harmony. Such beauty we see reflected in the complexity of nature, the give and take of loving relationships, the enrichment of interfaith dialogue, the welcoming of refugees, the creative embrace of change, and the creation of soul-stirring art like "St. Francis and the Birds." If we want to be instruments of God's peace, as in the "Prayer of Saint Francis," we must not look for easy harmony that comes by walling off what we fear; rather, we stretch our souls to include enriching contrasts that create more beauty in the world. Hospitality of soul is not an easy road. St. Francis did not choose easy, nor should we. It's scary to be so welcoming — so vulnerable — to the unknown. But isn't that the point of faith? We throw our arms wide to the world, trembling just a bit, and say, "Welcome!" In Adventures of Ideas, Alfred North Whitehead suggested that such a daring embrace of the world — a welcoming of intense harmony — is the way of peace for an individual or a civilization. For him, peace is "a broadening of feeling . . . self-control at its widest . . . It is primarily a trust in the efficacy of Beauty." A welcoming reach, a saintly blessing, a spacious sky that embraces all — hospitality opens the way to peace. In this we must trust.